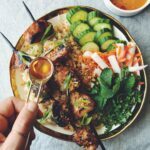 Light, refreshing, and filling, grilled chicken bowls are packed full of Vietnamese Flavor. 1 tablespoon dark soy sauce the thick one! Whisk together everything but the chicken in a small bowl for 1 minute until combined and sugar is starting to dissolved. Add the chicken chunks and stir to coat. Refrigerate over night or at least 4 hours. Meanwhile, soak 6 long wooden skewers in water for at least an hour. Fire up the grill and let it get all hot and fiery. Add a few chunks of chicken to each skewer and grill until the chicken is cooked through and there's a nice char on the nuggets. Remove from heat and set aside. Add water and sugar to a bowl and stir for 1 minute until dissolved. Add in lime juice, fish sauce, garlic, and sambal. Add more fish sauce if you'd like it saltier and add more sambal if you like it spicy! Toss carrots and daikon with 1/2 teaspoon salt and place in a strainer over a sink/bowl. Let the mix sit for 15 minutes then rinse with cool water to wash off salt. Set on paper towels to dry. Whisk together sugar with warm water until dissolved. Add in vinegar and stir again. Toss pickling liquid with the vegetable mixture and let sit for at least 20 minutes. Add 2.5 cups of rice to one side of each bowl. Add cucumbers, pickled daikon and carrots, fresh cilantro, and fresh mint to the other side of each bowl. Place 2-3 skewers on top of the rice side of each bowl and sprinkle with chopped scallions and crispy fried shallots. Serve with nuoc cham and enjoy!